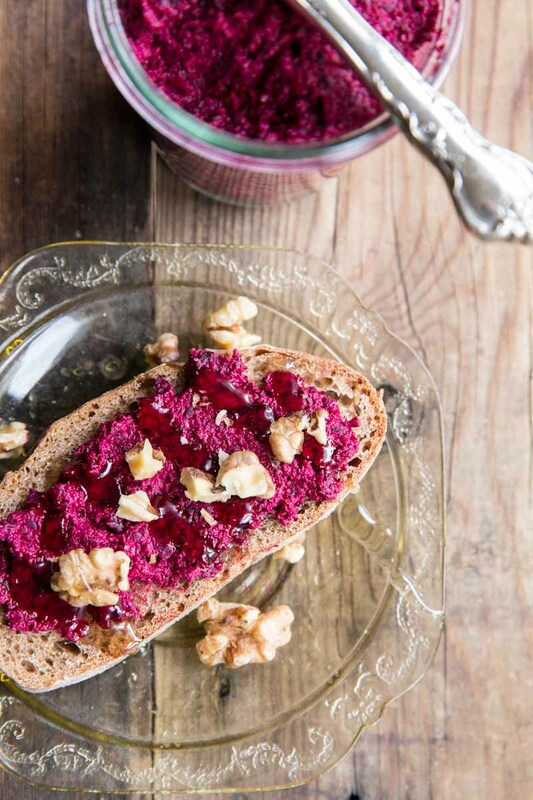 This Beet, Walnut and Honey Dip is a healthy snack my family loves. We spread it on toast, dip pita chips in it or use it in sandwiches. It’s easy, healthy and kid friendly! Today is my first day of culinary school and before I got started I wanted to share on here a few of my hopes for the course. This roasted beet, walnut and honey dip provides the perfect example. If I could narrow it down to one goal or hope for this brief stint in culinary school it would be this – simplicity. My desire is to come finish this culinary school and then return to the kitchen cooking more simply not more complicated. Maybe you were thinking the opposite… that I would return to my regular lifestyle of blogging with super complex recipes that most home cooks wouldn’t dare to try. But no, I promise, though I hope to learn a lot of great techniques, I only hope that they will help me to cook better, more easily and more simply. Let me explain more.. I hope to enhance my care for quality, fresh ingredients by learning how to use them more simply, letting their true flavors shine instead of masking them. 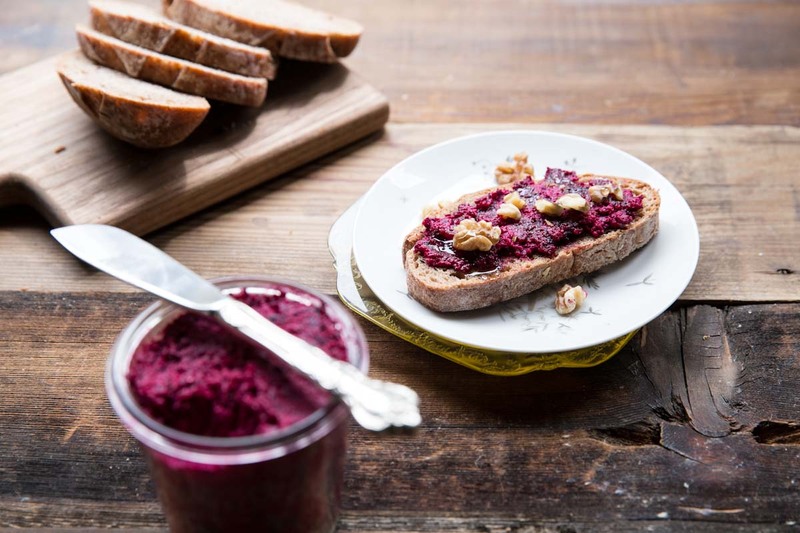 Like picking a perfectly ripe and in-season beet from the market, then taking it home to roast it perfectly and only add a few more ingredients to better enjoy its natural flavor like in this bright pink spread. gain more respect for ingredients, the life that they have and are passing along to those who enjoy them as food (this is something that I hope goes more from my head to my heart). begin with openness to new ideas and information from the teachers and mentors of my course – I hope to get new perspective and knowledge from those who have the far more experience than I.
find a better understanding of ingredients so that I can write more fully and more concise about them. know more of the whys behind techniques and recipes that maybe I already knew how to do. These are more for me than anything but thanks for listening :). I hope to stay on track during these 8 weeks of learning and to remember the hopes I have for this time. If there’s anything that you’re partaking in, I recommend you also taking time to jot down your own hopes and desires for your tasks ahead. Take some time to get a clear mind before foraging ahead! And some good beet dip alongside a little journaling session couldn’t hurt! 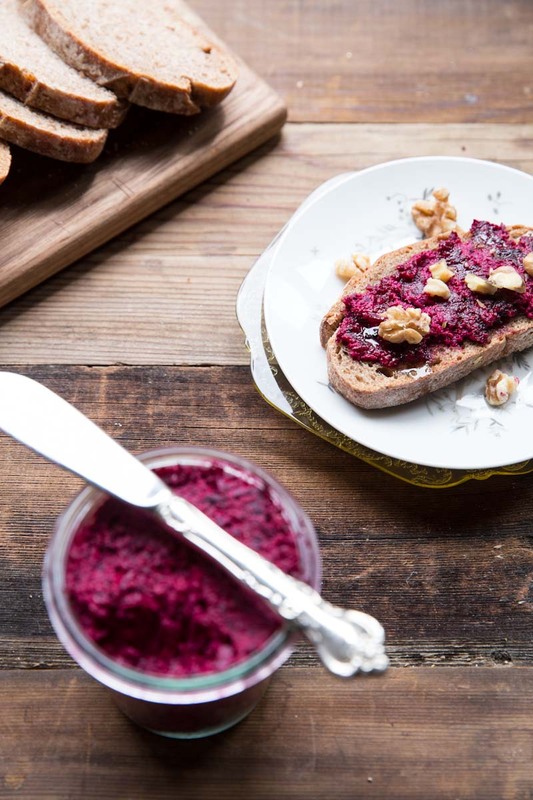 An easy and healthy 3 ingredient dip or spread using roasted beets. Heat the oven to 400 degrees. Chop off beet greens right at the stem and reserve for another recipe (try them chopped in a salad, sautéed with toasted nuts or with eggs). Wrap each beet in foil (keep skin on) and place then on a rimmed baking sheet. Bake for 50-60 minutes dependent on their size. For the last 8-10 minutes of roasting add the walnuts to the baking sheet. Check the beets' doneness by sliding a knife into the beet. It should go through smoothly and easily. 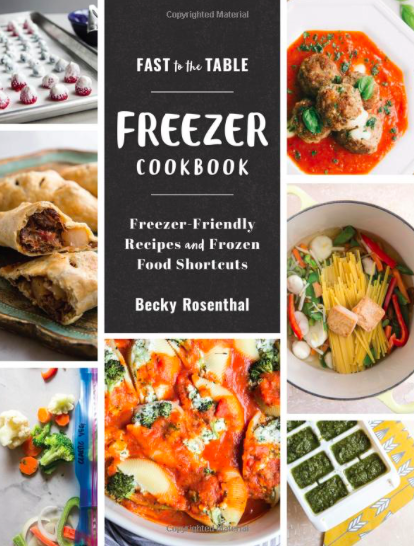 Let beets and walnuts cool. To get the skin off the beets, hold one of the beets in a paper towel and use the edges of the paper to rub the skin away. The skin should peel away easily; if it doesn't, the beets likely need to cook for a little longer. Peel the remaining beets. Place peeled beets and all of the other ingredients in a food processor or high powered blender and process until smooth. Serve with bread and extra walnuts and honey. Thanks Erin! I’m already loving it!! Love the goals you have for this new journey! I’m so excited to see what comes of it. 🙂 Best of luck today! Miss you too!! And how was that date of yours?? I’ve been dying to know! So exciting. I wish I was joining you. I wish so too Barbara!! Wouldn’t that be so fun!! The recipe!!! 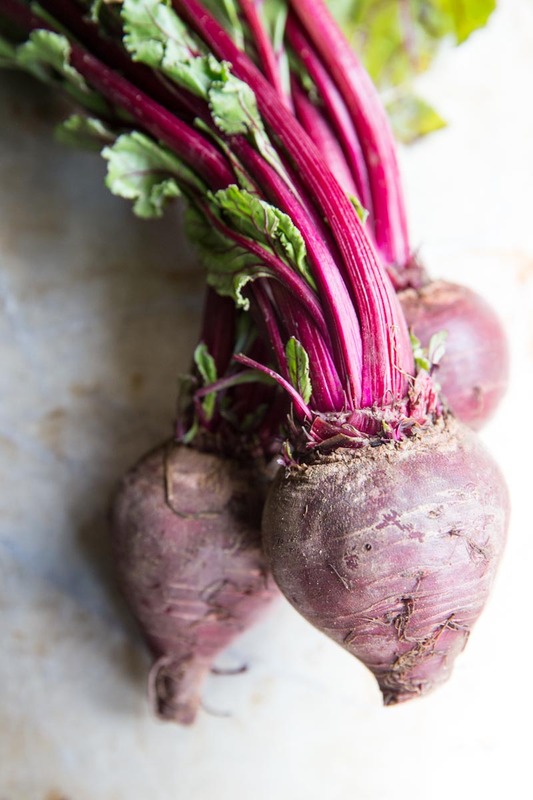 I am so making this dip–I roasted beets last night–now I know why! Wishing you much fun on this journey. I hope you take us along here on your site. Thrilled for your adventure and excited to hear more about it. Lydia, seriously, I think you would LOVE this program! 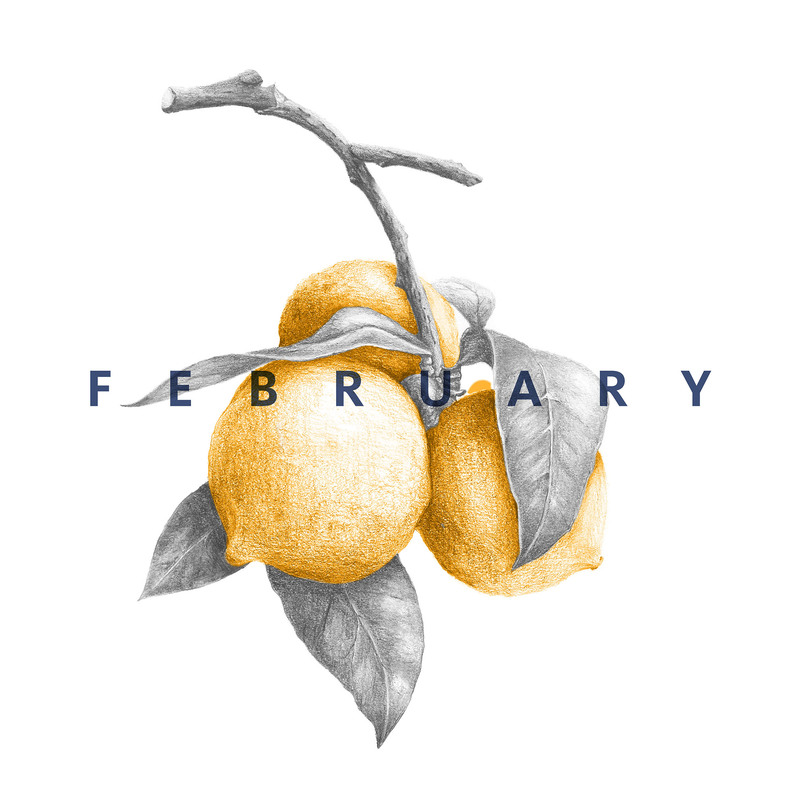 I can’t wait to share more about it… posting tomorrow. Beets are an absolute favorite of mine. Can’t wait to make this. And that bread looks divine. Good luck on your journey. I love your focus. yes!!! So glad you’re trying it Erin! Good luck on your journey. I love your recipe. I have to try it soon and hope it comes out delish. Thank Philips! Hope you give the beet dip a try and if you do, let me know what you think! Hi Becky. I gave the dip a try and the husband loves it. Thanks for the great recipe. The best part of it is that it is healthy. Sweet!! So glad to hear that someone else enjoys it!! This recipe looks yummy and fresh! I am gonna try at home! Hey becky…! I also read your post and this is one of my favorite recipe and its looks sooo delicious & sound yummy, I will try to make it. Thanks for sharing and keep shared your new ideas with amazing recipes…..!